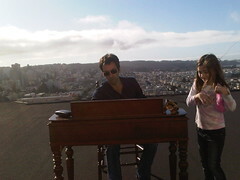 Courtesy Sound American Josh Rosenthal with his daughter. When Record Store Day hits the neighborhood tomorrow, Tompkins Square Records will release a handful of gems: “Imaginational Anthem, Vol. 6” documents the origins of American Primitive guitar music; Charlie Poole and the Highlanders’ “The Complete Paramount and Brunswick Recordings, 1929” showcases a rural string band from the late 1920s; Joe Bussard’s “Guitar Rag/Screwdriver Slide” collects tunes played with a screwdriver; and “For the Faithful” is a compilation of some of the trailblazing label’s best and newest tracks. The eclectic mix reflects the tastes of Josh Rosenthal, who started Tompkins Square Records while living in Alphabet City and kept the countercultural name even after he moved to San Francisco. Mr. Rosenthal is in his mid-40s but — wry and fit, with a full head of hair — he could pass for someone in his early 30s. He doesn’t look at all like an overburdened record honcho, even though he continues to release a dizzying number of CDs and records that plumb a plethora of genres: folk, jazz, Appalachian, blues, and just about everything else. Among his fans are Nashville producer T. Bone Burnett and Hal Willner, a producer of tribute albums who was the music director of Saturday Night Life from 1980 to 1991. “When I see a new record out and I see the Tompkins Square Records marker on it, I buy the record,” said Mr. Willner. At 16, he scored a gig working on sound decks at PolyGram, a now-defunct major label. After college, he worked in promotions for Columbia for five years and went on to make big bucks producing artists and bands at Sony. In 2005, after more than 15 years of breaking his back in the industry, he decided to start putting out music he loved on a label he owned, using the business acumen he had developed with the majors. In less than eight years, Tompkins Square Records has already released over 80 records, many of them beautifully packaged re-issues of obscure recordings from the past. Recent re-issues have included “Queen of the Flat Top Guitar” by Lena Hughes, a guitarist who originally self-released her album in 1964. For “The Origins of Primitive Guitar, Vol. 6” Mr. Rosenthal once again compiled tracks of acoustic-guitar-driven Appalachian folk music. One imagines the record honcho holed up in a dark room, smoking cigarettes, pulling his hair out, listening to records and trying to decide what he should release next. But the truth is actually far from that. “I feel like in some ways the label does me and I don’t do the label,” he said. These days, people often bring their records to him. Or he’ll hit on them randomly, like when he heard a Don Bikoff song on WFMU. “Next thing I know I’m buying the rights from his family and releasing his music,” he said. Tompkins Square Records has released records by young artist such as 31-year old Hastings-based guitar player and pianist James Blackshaw, Virginia-born 23-year old guitar phenomenon Daniel Bachman and North Carolina folk-pop act Hiss Golden Messenger. Mr. Rosenthal just wants to see them do well enough to be able to have a career. He knows he can only do so much. Correction, April 20, 2013: This post was revised to correct several errors. The label Mr. Rosenthal worked for at 16 was PolyGram, not Polygraph. He worked in promotions at Columbia and was not a producer. Hiss Golden Messenger is from North Carolina, not upstate New York. And the artist he heard on WFMU was Don Bikoff, not Lena Hughes.